With the help of needles, you can create a lot of original and useful things, for themselves, and their children. One such veshchichek are socks. This is very necessary part of the wardrobe with the help of the spokes can be made, how warm for adults, and thin for infants and very young children, brightly colored, or using the same color and with the addition of ornament. 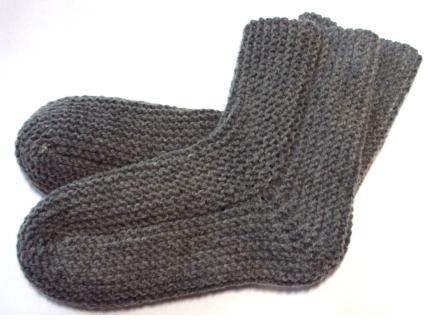 Knit socks with needles can be using at least two ways and many different kinds of knitting patterns. Determine what way you do it. Choose the right color yarn, and decide whether you want to do multi-colored socks or plain, with or without ornament. Buy and prepare the necessary tools: needles, pin, scissors, centimeter. Make the appropriate measurements: girth and length of the foot lift. The first measurement is done as follows:: centimeter is applied from the middle of the heel in a circle, clasping the highest point rise, to the point of. Foot Length is measured on its edge from the little finger to the start of the heel. Once the desired measurements have been made must calculate the required number of loops. To do this, measurements are added, and the resulting sum is divided by two and the blade length is obtained. Then you need to determine the density of the knitting yarn for selected. For this purpose, a sample provyazyvaetsya, then measured its length. After that, the number dialed loops, not counting the edge, multiplied by the length of the web and is divided by the sample length associated. In that case, if the number of loops multiple failed 4, then add to it the missing number of loops. The usual spokes recruit the required number of loops, then divide them into four and each part of the toss on four needles hosiery. then begin knit gum the required length. And the beginning of knitting are first recruited loop. short length sleeves height on the average 7-8 cm, if desired also make socks hems, gum length is doubled. Transfer the loop from the two extremes of the spokes on one long, as the heel begins to fit in with the rectangular cloth, others spoke not get under way until the end of the heel provyazyvaniya. To heel last longer, a warp yarn can be added to another Strength. Then knit stocking st: on the front of the toe facial, on the wrong Wrong, not forgetting provyazyvat edge loop. blade height for heel should be approximately equal to 5 cm, if the socks are intended for an adult and about 3cm, if you want to link children's socks. Knit the required length, We share the obtained web to 3 equal parts and toss them each separately to other spokes. If the number of loops, dedicated to pyatochku, It is divided into three and the remainder, the extra loop add to the middle of the canvas divided. 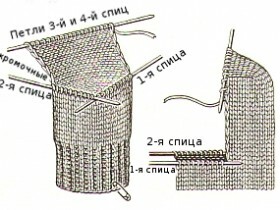 Hinges at the spokes need to knit, that the working thread has appeared at the middle part, then continue knitting follows: knit middle part of the penultimate, stocking st, then last loop provyazyvaem together with the first loop, located at the third spoke. 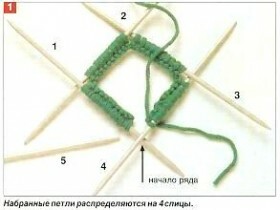 Then pivoted knitting, remove an edge and again provyazyvaem middle part of the penultimate loops, and the last knit together with the first loop, located on the first spoke. In this way, knitting is repeated until, until the first and second spokes will not end loops. On the heels of the barrels and the beginning of a series of loops, located on deferred spokes, each side is knitted loops new, this can be done with a hook. The number dialed loops must be approximately equal to the subtraction of loops, but in any case no more. If, however, they got a lot, then do a uniform decrease across the heel. Then again spread the hinges on four needles and continue knitting sock stocking st in a circle. Decrease loops to round sock starts from the moment, as a sheet will reach the start of the big toe. From this moment on each spoke at the end of the penultimate and the last number of loops provyazyvayutsya together as one, yet they will not remain one eyelet. The final step is to provyazyvaniya last loops together as one and fixing thread. In the same way, and the other knit sock. first, we do, as in hosiery knitting, the upper part of the sock. For this are finished a centimeter four pattern elastic 2×2. Then lift the front of the smooth surface of the canvas for another 8 centimeters. In the next phase we begin to knit the heel. To do this, all the main loop fabric, not including the edge, share on 4. Then provyazyvaem extreme and the two middle parts, which will be in the future promenade. The last part of the reserve does not knit, we expand the work and perform 1 nakid. Then provyazyvaem only the middle of the loop and again, expand the work. Next knit this part, dovyazyvaya not at the end of each row 1 loop, and performing first sc, until that moment, when the middle part of the loop is not reduced to 10. In the next stage we are beginning to be added to the heel loop with the side portions, for this provyazyvaem along the first loop marginalia, sc and up midway. At the beginning of the series and are continuing to do sc. In this way, knitting continues until they are all left knit loops. After which all received provyazyvaem loop stocking st before the start of the big toe and proceed to the formation of mysochkah. To do this, divide the tabs back on 4 and in every other row 4 provyazyvaem times the last two tabs of each of the resultant web chetvertinki, then subtraction made in each row have. Remaining 4 provyazyvaem loops together and fasten thread. After that sock folded wrong side up, and neatly stitched. Origin ready nosochek, possible to start knitting the second. Knit baby socks can be the same way, observing the necessary proportions. It would be better, if during the knitting as you complete each part of the product, all the time to try on the canvas, not to be mistaken with the size. Knitted socks with their hands to themselves, and even more so for a kid always look very original and beautiful.